Nikon has announced a new entry-level DSLR, the Nikon D5600, a slightly upgraded of the D5500 with improved wireless connectivity and timelapse video. At the beginning of this year Nikon introduced the first always-connected DSLR in the shape of the Nikon D500, and now we’re starting to see the same technology come to its more affordable cameras. 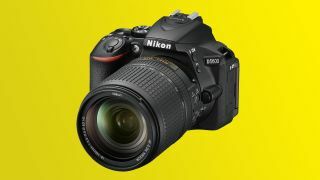 The Nikon D5600 comes sporting the same SnapBridge technology first seen on the D500, allowing users to maintain a constant wireless connection between the camera and smartphone. While paired, the D5600 can back up a continuous stream of images to Nikon’s Image Space photo sharing service while synchronizing timestamp and location data. The Nikon D5600 also comes sporting a simple timelapse movie function, as seen on the Nikon D7200, which compresses long periods of time into short videos. Aside from these new functions, the Nikon D5600 sports many identical specs to its predecessor, including a 24.2MP APS-C sensor without an optical low-pass filter, and Expeed 4 Image Processor. So overall we should see very similar image quality – not that we’re complaining. The Nikon D5500 has proven itself to be a flexible and versatile camera for stills, and particularly video shooting, with 1080p 60fps video output and a 3.2-inch 1,037k-dot vari-angle touchscreen display that users can spin forward. Initially Nikon is releasing the D5600 in Japan, with pricing and availability for other territories yet to be announced.